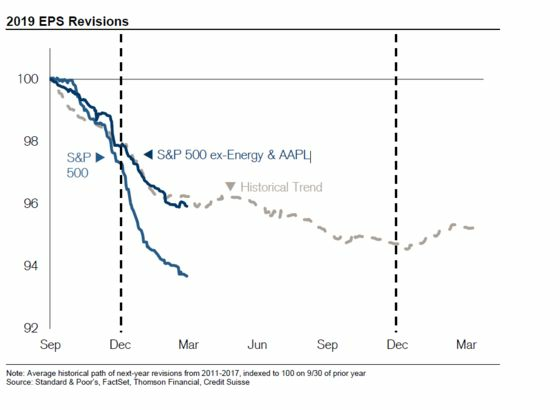 (Bloomberg) -- For anyone worried an earnings recession is about to torpedo the rally in stocks, some contrary signals have emerged. One is a lessening in the earnings downgrades by analysts that have clouded sentiment toward reporting season, which begins this month. Another is the sudden bounce in estimates for sales growth over the next 12 months, which are up 0.7 percent from their February low. It won’t be enough to keep first-quarter results from being rough, but it could suggest some of the earnings paranoia that has run rampant since last year was overblown. While profit estimates are still falling, drilling down into measures of sales and pricing power reveals a more nuanced picture. A suite of concerns weigh on the top and bottom lines of America’s largest companies, from higher wage growth and a stronger dollar to a trade spat with China and moderating economic growth at home. 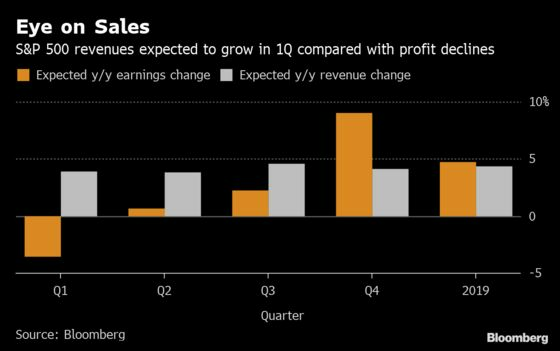 The worries have pushed analysts to slash their 2019 earnings estimates by 5 percent since September to $167.80 a share. But a lot has changed since last year, from a more dovish Federal Reserve to signs a deal with China could come soon to optimism that global growth isn’t falling as rapidly as expected. Partly thanks to that, the rapid pace of earnings downgrades is easing. Bank of America Corp.’s estimate revision ratio, which measures the number of analysts cutting forecasts versus raising them, advanced in March for the first time in six months. More analysts are still slashing their forecasts than lifting them, but the ratio now sits at the highest level this year. The downgrades themselves mask a healthier state of growth than is usually recognized, strategists at Credit Suisse Group AG say. 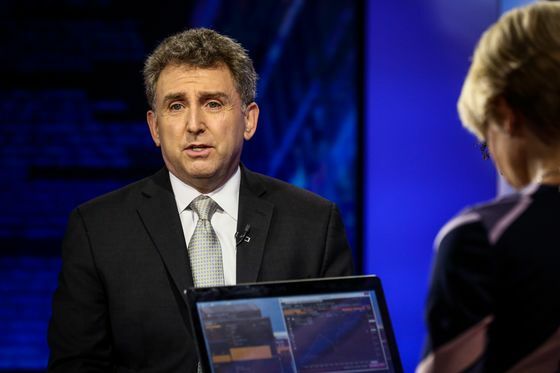 The drop in earnings estimates is being disproportionately influenced by cuts in Apple Inc. and energy stocks, according to Jonathan Golub, the bank’s chief U.S. equity strategist. Take them out, and the pace of revisions looks normal, he said. 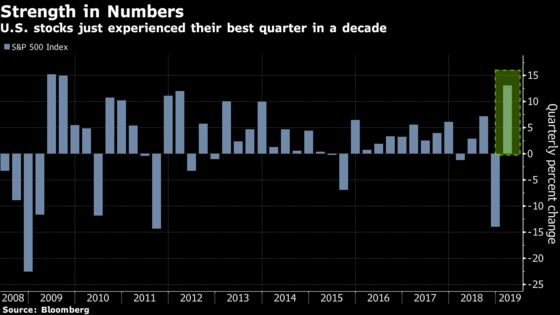 The S&P 500 rose 13 percent last quarter, the first period in four years when negative guidance was greeted by higher share prices, according to data compiled by Morgan Stanley. Analysts have revised their expectation for corporate revenue growth higher by 0.7 percent from February, and now expect top-line growth of 4.4 percent in 2019. They currently call for a 4 percent revenue gain and a 9.8 percent earnings drop in the quarter that ended in March. The S&P 500 rallied on Monday as strong manufacturing data from China eased concern about a slowdown in global growth. More data showing an economic recession isn’t imminent in America could give U.S. stocks an additional boost.